The search shows model-specific products. Oils, gaskets, spark plugs and other generic items are found from the product categories. D2 big brake kits for front axles. The 286 - 400 mm kits offer stopping power as well as looks for both the streets and track. Complete bolt-on kits are supplied with everything from braided hoses to big calipers. 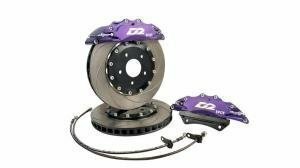 D2 big brake kits for rear axles. The 286 - 400 mm kits offer stopping power as well as looks for both the streets and track. Complete bolt-on kits are supplied with everything from braided hoses to big calipers. Wanna go back to a recent page? Copyright © Race Performance Oy 2006 - 2019.